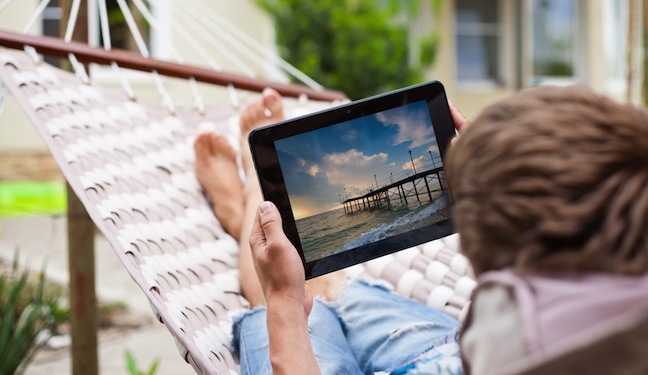 The summer of 2013 has been, in many ways, the summer of the iPad. Over the years, our annual family foray to Lake Michigan has become, aside from the usual vacation pleasures, a measure of how technology has changed our habits when it comes to information and entertainment. We've come a very long way from the farm edition of the Chicago Tribune and a small black and white television with antenna ears. This year, in addition to bringing laptops (mainly for the steady stream of office and personal e-mails that are now, irreversibly, an accepted 24/7 routine), smartphones, iPods, a stack of books, and our New York Times subscription delivered at dawn, we added an iPad (mine) and an iPad Mini (my wife's). Also, for the first time, we had household wi-fi (no longer really optional) and cable installed on our television as an incentive to possible renters in the off-season. The television was turned on once to watch a CNN program Our Nixon, which was supposed to be an illuminating documentary, but was disappointingly familiar and so loaded with commercial breaks that we soon gave up. Our only trip to the multiplex was to see Ashton Kutcher's portrayal of Steve Jobs in the biopic Jobs. There were no more than a dozen people on hand for the weeknight evening show. So much for the prevalence of movies, television, and DVDs that were only a few years ago the leading aspects of after-dinner activity, aside from the continuing mainstays of beach fires (and amateur fireworks), cookouts, and a round of evenings with relatives and neighbors. This was the summer when, at least in our house, the tablet came fully into its own, achieving dominance among the array of gadgets that we had assembled. It isn't that the iPad is necessarily preferable to competitors from Kindle, Nook, or the Android-based systems, but if you own one and load it up with a selection of favored apps and bookmarked websites, the sheer range of what you can do on this wireless, portable apparatus has to astound even seasoned consumers of digital paraphernalia. At the risk of turning this piece into an Apple commercial, here is some of what we used the iPad for on this vacation (I should point out that our local post office has closed and we do not have a mailbox, so digital access was essential for publications we might otherwise choose to read in print). The New Yorker, Bloomberg Businessweek, The Economist, and The Wall Street Journal. We used The Atlantic app, as well as the updated NPR app, which carries every program and direct access to local stations and their major shows. The PBS app had American Masters, American Experience, Frontline, and scores of other features. C-SPAN has multiple sites. On iTunes there was a tremendous array of films and television shows. Amazon's instant video also had an extensive list for sale or rent. Pandora provided an irresistible musical cornucopia. And we had HBO Go and YouTube, and of course Kindle books and iBooks to choose from. For tablet users, there are, of course, hundreds of thousands of additional apps, and a seemingly infinite selection of websites. To appreciate what a remarkable impact the iPad has had, consider that it was only in April 2010 that the first models were released. At last count, according to figures compiled from several sources, including The Verge, a leading technology web daily, there have been more than 100 million iPads sold. The rise of the tablets and mobile phone devices (which have many of the same features) has had a significant downward pull on personal computers. An Economist account of the impending retirement of Microsoft CEO Steve Ballmer reported that, despite the long preeminence of PCs, "people increasingly prefer to buy mobile devices made by Apple or running Google's Android operating system. Sales of PCs have been falling at double-digit rates.... Microsoft's own tablet, the Surface, has been a flop, forcing it to make a $900 million write-off in its latest results." Microsoft is still hugely profitable, but in its inability to capture the apparent magic of the tablet is a problem the next leadership of the company will have to solve. The announcement this week of the $7 billion cash acquisition of Finland's Nokia is clearly a major move toward establishing a leading position among mobile providers. The tablet has also cut into the sales of e-readers, a source of understandable concern to book publishers. According to the International Data Corporation's figures, e-reader sales peaked at 26.4 million in 2011 (only four years after the Kindle was introduced, establishing the e-book market). In 2012, sales dropped to 18.2 million units, and the shipments this year are forecast to be somewhere between 10 to 15 million with projections of continuing drops at 14 percent through 2016. The assumption publishers are making is that the tablet user is less likely to be buying books than the dedicated e-reader consumer has been; with so many more choices on the tablet, that seems a reasonable prediction. Figures for e-book sales have flattened out in recent results at around 20 percent of sales, but are still forecast to grow over time, especially in some of the fiction categories where they are now as high as nearly 50 percent of sales. For now, the future of the tablet does seem to be especially robust compared to other computers (with the exception of the most elaborate app-supported smartphones). Yes, this was definitely our summer of the tablet. But if anything has become clear with each year's innovations, it is that there are always more coming. It has been barely a decade since we dropped AOL dial-up, the fax machine, and the weekly Fed-Ex package of first-class mail from home and office (which has now been reduced mainly to bills readily available online). What's next? A tablet with even more capacity, speedier downloads of video, and (here's my personal wish) apps for independent booksellers across the country that can make a reasonable run at competing for the e-book and print loyalists with today's retail titans. Next summer's vacation is only eleven months away.